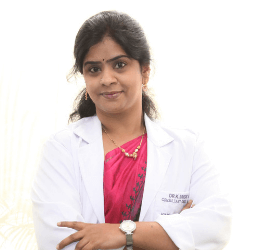 Dr. Sridevi Kodiganti is a qualified Obstetrician and Gynaecologist experienced in High Risk pregnancy and Infertility. She has more than 16 years of clinical experience. She has completed her MBBS from Karnataka Medical College, Hubli and DNB in Obstetrics and Gynaecology from Govt. Maternity Hospital, Nayapul Osmania Medical College, Hyderabad. She has completed her Basic and Advanced Laparoscopy and Hysteroscopy training from Ramesh Hospital, Bangalore in 2011. She has done 12 months of Fetal Ultrasound Programme. She has also done advanced on-site programme from Bangalore Fetal Medicine Centre in 2013. She has done IMA (Indian Medical Association) Fellowship in Infertility trained from Ferty9, Secunderabad. She has completed her Basic Life Support / Advanced Cardiovascular Life Support / Advanced Life Support in Obstetric courses and is also an Advanced Life Support in Obstetrics Instructor. She has worked as Assistant Professor in MNR Medical College & Bhaskar Medical Colleges. She has worked as Senior Registrar / Junior Consultant at Rainbow Hospitals, Banjara Hills. She has worked as Consultant at Neelima Hospital Moti Nagar / Sanath Nagar, Hyderabad. She is specialized in handling High Risk Pregnancies, Recurrent Pregnancy losses, Infertility, Obstetrics and Gynaecology scans. She is a dedicated and competent professional committed to woman’s health, with excellent social interpersonal and communication skills to interact with patients and her co-workers. Her empathetic and holistic approach to woman’s health has made her well known among her patients.